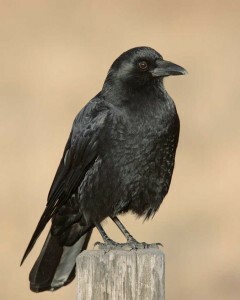 Appearance of the American Crow. There have been a lot of researches done about birds and their behavior. 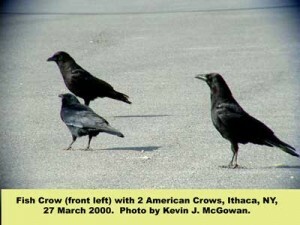 Lately, scientists have focus their study on American Crows. There is something special about the American Crows. They are very smart learners. American Crows are able to do things that other birds can’t such as finding other ways to search for food. There are four categories that can help us understand a bird’s biology. We have to encounter for the birds’ s size and shape, color pattern, habitat and behavior. with the wingtip feathers spread like fingers and their back would be rounded or squared (Caffrey and Verbeek 2002). When crows molt, the old feathers can appear brownish. 2 American crows and a fish crow (front left). Northwestern crow location is in the Pacific Northwest while the American crow is in North America. Crow differ on the region that they are found in. The Northwestern crow can only be found in the Pacific Northwest while the American Crow is only present in North America. The common raven has longer and more squared bill than the American Crow. 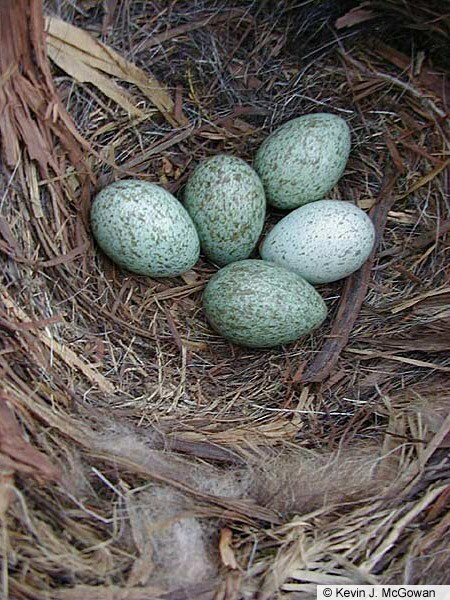 American Crow nest with eggs. American Crow nestlings, 14 days old. nestling occurred usually around the second or third week of April. Finally, the departure of the young from nest usually occurred during summer season (Dunne 2006). 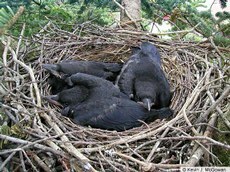 The incubation period of the American Crow is usually 16 to 18 days while the nestling is usually 20 to 40 days. 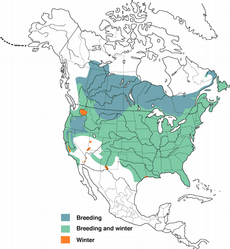 The habitat of choice of the American Crow is wide range. There are two requirements that could help us find the location of an American Crow. They would be present where there is openness because of ground feeding and also in the presence of scattered trees or woodlots for safety and nesting. Therefore we will find the American Crow in farmland , cemeteries, city campus, Vassar campus, golf courses, the shores of rivers and scrubs. 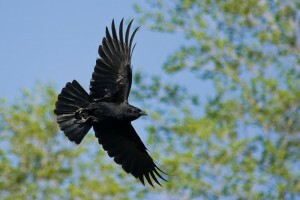 When it comes to foraging behavior, the American Crow walk, hop, flight and preen. This bird is a very social bird, more often seen in groups than alone. Sometimes they form flocks in millions. Since the offspring have to be 2 years old until they can breed, they would often stay together in year-round family groups that consist of the breeding pair and offspring. The young ones would help the parents raised the offspring until it’s time for them to leave and start to breed. Even though the American Crow is highly social, it does not mean that they do not get involved in agonistic behavior. They get in fight with others either within family or outsiders. However they mostly avoid physical contact through body language and sound. They mostly fight because of food and territorial trespass. 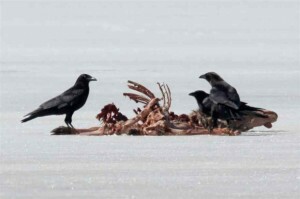 American Crows eating eating deer carcass frozen in ice. American Crow pretty much eats everything. They eat raccoons, insects, mice, grains, seeds, fruits, nuts and they can also catch a fish. The American Crow cannot pick on large dead animals despite their heavy bill, they must wait for the carcass to decompose in order to feed. Now that we have learned the biology of the American Crow, we can go back and see why would scientists be interested into studying them. American Crows are very good learners. They can make up and use tools. Evidences showed an American Crow can use a cup to carry water over to a bowl of dry mash. They can also shape their own piece of wood and they will stick it in a hole in search for food. The reason why they can do such thing is because American Crows are omnivores which means that they eat anything therefore in search for food, they try to adapt by learning strategies on their own to find the materials needed to survive. Author: Etienne. C and Waite. I. This entry was posted in Dutchess County Birds. Bookmark the permalink.